Methods: To overcome the BBB obstacle, NLCs were used in this study as carriers for IDV, which were optimized through two steps: a “one-factor-at-a-time” screening followed by a systematic multiobjective optimization. Spherical smooth-surfaced Nanoparticles (NPs), average particle size of 161.02±4.8 nm, Poly-Dispersity Index (PDI) of 0.293±0.07, zeta potential of -40.62±2.21 mV, entrapment efficiency of 93±1.58%, and loading capacity of 9.15±0.15% were obtained after optimization which were, collectively, appropriate in terms of the objective of this study. 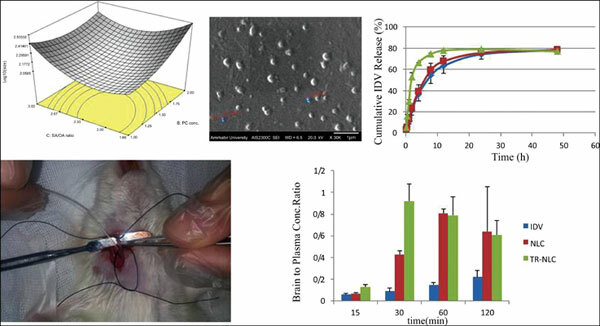 Result: The surface of the optimized NPs was, then, modified with human Transferrin (TR) to improve the drug delivery. The particle size, zeta potential, and PDI of the TR-modified NLCs were 185.29±6.7nm, -28.68±3.37 mV, and 0.247±0.06, respectively. The in vitro release of IDV molecules from the NPs was best fitted to the Weibull model indicating hybrid diffusion/erosion behavior. Conclusion: As the major in vivo findings, compared to the free drug, the NLCs and TR-NLCs displayed significantly higher and augmented concentrations in the brain. In this case, NLC and TR-NLC were 6.5- and 32.75-fold in their values of the brain uptake clearance compared to free drug. Blood-Brain Barrier (BBB), Nanostructured Lipid Carriers (NLC), indinavir, transferrin, neuropharmacokinetic analysis, Highly Active Anti-Retroviral Therapy (HAART).